Yes. This is what I meant. Maybe I should have written "Some reasons why the American Narrative is broken". Since the Mmrnmhrm is 100% oriented towards finding scientific truths, I think it is safe to say that the narrative will become much more truth-oriented after the emergence of the Chmmr. I think I understand the role of the sun device better now. The takeaway your original graphic seems to be proposing is that we ought to stop listening to what polarized left or right wing political speakers have to say. This seems wholly wrong to me -- if polarization is happening (and I don't disagree that it is) then we should be examining what is dividing them and why each side feels strongly about the issues which separate them. Of course we should think critically about what each side says, but to think critically you can't ignore them. How does each side justify its strong beliefs? What are the outcomes of following each set of beliefs to their logical (most extreme) conclusion? The divisiveness of certain issues is not noise. It's a signal. It usually indicates injustice or harm being done to which there is resistance on one side and a desire to perpetuate it on the other. Our job as socially conscious observers and agents should be to tease apart which is which where possible and find which ideologies and policies are fair and beneficial and which demand or cause the exploitation or suffering of people. The current polarization seems to be caused by more personal advertisements and recommendations. Youtube will recommend me videos that are similar to the videos I already have watched, since I am more likely to click on those videos. After a while, the machine learning algorithm which makes recommendations to me in youtube, will only feed me with videos that fit my confirmation bias. It would be somewhat counterproductive for youtube to recommend me videos that I wouldn't click on. However, in the past personal advertisements/recommendations didn't exist, so we weren't exposed to so much information that fitted our confirmation biases. This is why we need the Chmmr. We need a machine learning algortihm that focuses on educating us into mentally healthy prosperous states. Not machine learning algorithms that feed our confirmation biases. You shouldn't fear superhuman artificial intelligence. You should fear subhuman artificial intelligences that feed confirmation biases. You should totally fear superhuman intelligence that wants what you do not want. Think more about it as what you would want for your children. You don't necessarily want a superhuman intelligence that gives your children what they want. Rather you want a superhuman intelligence that gives your children what they should have in order to develop into a mentally healthy prosperous state. I am sorry, I thought you would understand my shorthand since I thought you'd read enough LW. Well, it doesn’t start as a superhuman intelligence. It starts as a machine learning algorithm that only has one goal, which is to educate children. We have tons of research on how to educate children today, so you start with implementing what we already know into the algorithm. For example, the first challenge for the algorithm might be to teach a child the alphabet and the numbers. When the algorithm notices that the child has accomplished those tasks, it might start to teach children about more complex things, such as words and mathematics. The algorithm doesn’t need to invent all the “teaching segments” itself. Rather, it might use “teaching segments” that are made by humans, for example videos and puzzle games. We might also create a another algorithm which only focuses on making "teaching segments". 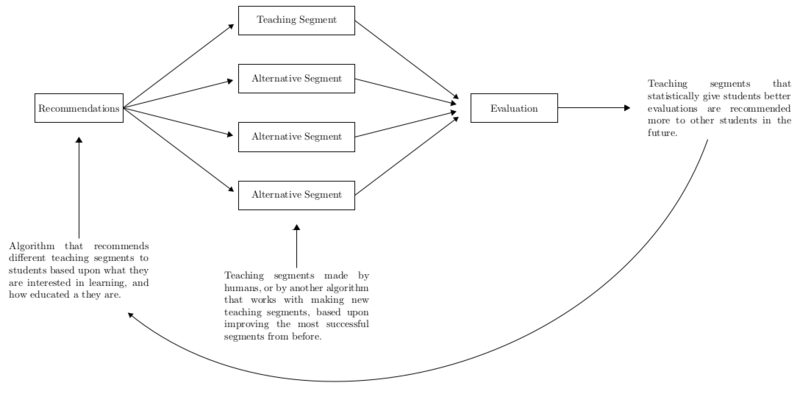 But the main algorithm will continuously evaluate the educational progress of the students, and “teaching segments” that are found to be highly effective in facilitating educational progress will be recommended more after a while, while “teaching segments” that are found to be less effective will be used less after a while. The algorithm should not force kids to be educated in any specific path. Rather, it should be highly open, so that kids can choose which educational paths they want to take. If a kid wants to focus on mathematics rather than on linguistics, well, then the kid should have a lot of freedom to go down that path. Having a lot of freedom is a crucial part of fulfilling human values. Now, sometime far into the future, this educational algorithm might become “superhuman” in the sense that it might be able to educate anyone better than any human being, into the smallest detail of any science. There might be a danger then, in that it educates us in ways we are incapable of understanding the consequences of. If however all the education is firmly rooted in science and Bayesian statistics, then I don’t think we should worry. It will probably be much better than any educational program we have today anyhow. And people educated by this superhuman intelligence, will be smarter and more informed than us anyhow. Now, contrast this with the machine learning algorithms that are dominating Internet today. Those algorithms only want to feed your confirmation biases in order to make more money for their companies. I argue that these algorithms are much more dangerous, since they are making people more ignorant and intellectually segregated. You think it is difficult to find goals that are compatible with the fulfillment of human values. Well, I certainly don't think the algorithms that are feeding your confirmation biases are doing that. Although I agree with "Less Wrong" about lots of things, I don't necessarily agree with anyone about everything. I certainly do think superhuman machine learning algorithms can be dangerous. Just not the one I have envisioned. Only through education does one come to be dissatisfied with his own knowledge, and only through teaching others does one come to realize the uncomfortable inadequacy of his knowledge. Being dissatisfied with his own knowledge, one then realizes that the trouble lies with himself, and realizing the uncomfortable inadequacy of his knowledge one then feels stimulated to improve himself. Therefore, the processes of teaching and learning stimulate one another. The ideal teacher guides his students but does not pull them along; he urges them to go forward and does not suppress them; he opens the way but does not take them to the place. No one can teach, if by teaching we mean the transmission of knowledge, in any mechanical fashion, from one person to another. The most that can be done is that one person who is more knowledgeable than another can, by asking a series of questions, stimulate the other to think, and so cause him to learn for himself. If you want happiness for a year, get yourself a fortune. If you want happiness for a lifetime, help someone else. Give a bowl of rice to a man and you will feed him for a day. Teach him how to grow his own rice and you will save his life. Education breeds confidence. Confidence breeds hope. Hope breeds peace. Mostly by Confucius and Socrates. The divisiveness of certain issues is not noise. It's a signal. It usually indicates injustice or harm being done to which there is resistance on one side and a desire to perpetuate it on the other. The current polarization seems to be caused by more personal advertisements and recommendations. These explanations could very well be what is happening with any number of controversial issues. But I would not automatically assume so for every instance. It could just as well be that peoples living in different environments, with different lifestyles suited to said environments, want and/or need to be different from each other in many ways. But when they are forced to live under one rule set, these culturally and/or environmentally distinct peoples are then incentivized to take control of that rule set and customize it to their own tastes or needs which will necessarily harm the other. Hmm, is the word you want to use here "confidence" or rather competence? Are you talking about Weak or Strong AI? Education breeds competence. Competence breeds prosperity. You can apply Bayesian statistics also to political beliefs, and then political beliefs should converge, even if we live in different evironments. That our beliefs are becoming increasingly segregated must imply that we are more governed by confirmation bias than by honest Bayesian inference. Any superhuman general intelligence. Or even approximately human, if it's cheap enough to copy itself all over the place. Science itself might actually be considered a superhuman intelligence, since there aren't any human beings that know all of Science. Science also seems to evolve faster than what any single human being can keep track of. Even if you read all the biggest journals, from all the biggest sciences, you are only going to see a small fraction of everything that is going on. I have been watching Jordan Peterson's course called "Maps of meaning". I agree that social media technologies have augmented confirmation bias. And thereby made compromise more difficult. But I would argue that if you need to compromise in the first place, there is already a more fundamental problem at work. I have to agree with Zanthius insofar as defining any weak AI (including any purely software AI that requires no revolutionary new hardware paradigm) as a superhuman intelligence would necessarily also define many cultures and codified thought and behavior patterns like science as the same.